In case you haven't heard, since Justice Antonin Scalia passed away last February, there's been an opening on the Supreme Court that still hasn't been filled. Pending an impending-apocalypse show of love, friendship, and doing-the-right-thing from Senate Republicans, President Barack Obama will not get to pick the next justice of the Supreme Court. As a result the next president will appoint at least one and possibly more justices for the highest court in the land. In short, number 45 will potentially have game-changing power over Supreme Court makeup. It's true, the 5-3 decision in Monday's Whole Women's Health v. Hellerstedt would have had the votes to overturn Texas House Bill 2's (HB2) abortion restrictions, even if Scalia were alive or a conservative justice were appointed. But what this case should remind us is how fragile the Supreme Court support for abortion access and other socially progressive issues could potentially be. Justice Anthony Kennedy acted as a swing vote, but his voting against the restrictions was far from guaranteed. And if he had voted to uphold the restrictions, the 4-4 vote would have resulted in a tie and, thus, affirmed the lower court's approval of the restrictions. In spite of my general apprehension of all things numbers, let's look at this mathematically. Although it may be impolite to point out, we have a handful of old justices who have been on the bench for decades. On average, a Supreme Court justice retires at the age of 78.7, although a lot of justices die on the bench before taking their retirement. By the time January rolls around and our next president takes office, Justice Ruth Bader Ginsburg will be 83, Justice Kennedy will be 80, and Justice Stephen Breyer will be 78. Although Supreme Court justices are not supposed to be swayed by their political ideology or heavily discuss party affiliation, it is pretty widely known that Ginsburg and Breyer lean Democrat and although Kennedy identifies as Republican, his recent decisions in Whole Women's Health and last year's gay marriage decision, Obergefell v. Hodges, show him serving as a critical vote for left-leaning support. 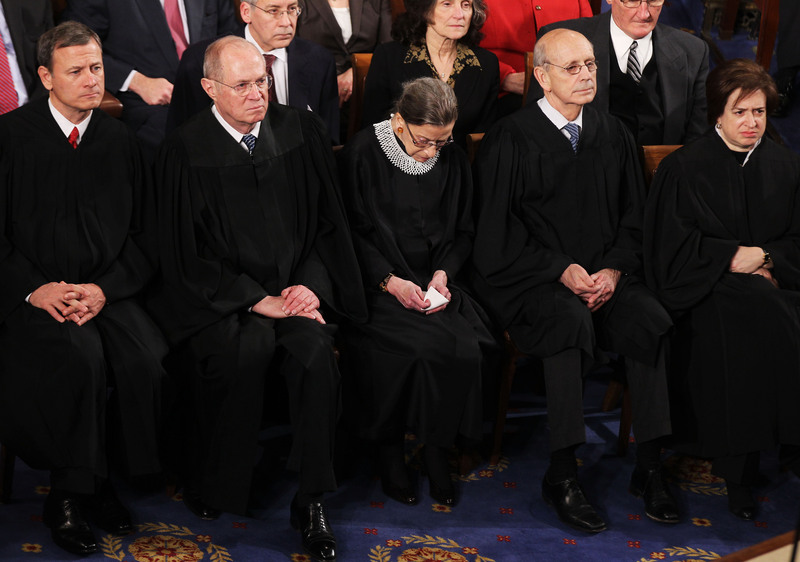 If we assume Kennedy, Ginsburg, and Breyer retire from the bench in the next four years (which is not a crazy assumption, by any means), we are left with three conservative-leaning justices — Samuel Alito, Clarence Thomas, and Chief Justice John Roberts — and two liberal-leaning justices — Elena Kagan and Sonia Sotomayor. The next president will potentially have four spots to fill on the bench. That's a huge amount of power to sway a remaining group of five that is split pretty tightly, though generally not leaning towards liberals' favor. Presumptive GOP nominee Donald Trump has already released his Supreme Court shortlist, and as NBC News reported, "The list largely mirrors the wish list of the conservative think tank, the Heritage Foundation." The rulings in cases like Obergefell and Whole Women's Health are not necessarily set in stone. If another case challenging LGBT or reproductive rights makes it up to the Supreme Court, there's no guarantee justices wouldn't revise the court's stances based on their own interpretations of the Constitution or their own political values (whether they'd openly admit this latter point or not). Think about that before you go to vote in November.